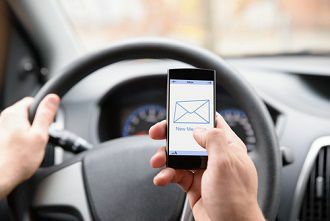 There is a 40% probability that a crash will involve using a cellphone. 33 percent of drivers between 18 to 64 text or read texts while driving. 341,000 crashes in 2013 involved texting and driving. A person has a four times higher risk of causing a crash while using a cellphone. Be a good example. Teaching by example is a powerful way to prevent your kids from texting and driving. Do not engage in this practice, or pull over if you must text while behind the wheel. Have a no text and drive rule. Tell your teen drivers that they cannot text while driving and educate them as to the dangers of this. It is also important not to let them be passengers with friends who engage in this unsafe practice. Become better informed. Read articles about the dangers of texting and driving to become better educated. Then share this information with your family, friends, and your children’s schools. Even if you and your family take a pledge not to text and drive, you will unfortunately be surrounded by other drivers engaging in this unsafe practice. If you are injured in a crash because of this, you could be entitled to compensation from the negligent driver. Start an online chat to schedule a free consultation with our experienced car wreck attorneys.